What does turning 60 mean for a woman today – a woman who came of age in an era of visible women and who is reaching this milestone at a time when invisibility is still a common experience in older age. New Zealand photographer Jenny O’Connor was approaching 60 herself when she started wondering: What would hitting 60 mean for her; and how were other women her age experiencing the moment? 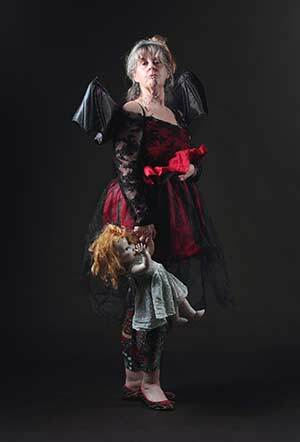 For her project, O’Connor spoke with and photographed 60 women who were turning 60 – most of them had responded to a Facebook post inviting participation – and asked each to write something about themselves; whatever they wanted to say. Then she built a photo shoot around each woman’s story, complete with props and costumes. “I didn’t want it to be about women who have done great things or are well known, because my belief is we all do wonderful things,” she says. Since the book’s publication earlier in 2014, portraits from O’Connor’s series have been shown locally. She’s hoping “Visible” will eventually tour as an exhibition. O’Connor spoke to us by Skype from her home in Wellington, New Zealand. What inspired the title for this project: “Visible”? My working title for the project was “Seeking 60,” and as the project grew and more women agreed to participate, we’d actually meet up. Lots of conversations came up around who we are, what we are thinking about when we’re 60, reflecting back on what it would have been like for our mothers and grandmothers to have been our age. The word “Visible” kept coming up because I think we shared this milestone feeling of being more certain about ourselves in some ways, but less certain in others. So many of us now know that we are way more visible than our mothers and our grandmothers ever were. We’ve fought for things; we’ve been up front in human rights and other fights in our generation. Women found their voices in our generation. They went to work and they made choices about their lives. And most of them are still en route. But there’s that little thing that niggles away at the back of the mind: “But, what now?” We’ve sort of been visible, we’ve done things that other generations have never done, we’ve found our voice, but is it going to matter? And how do people perceive us? Did your initial goal change as the project unfolded? Originally it was just going to be an exhibition, I didn’t originally intend to do a book. At the 40 milestone gathering [when 40 women had signed on] I said to them, I’m starting to think that this probably deserves to be sitting around on coffee tables rather than just a one-off exhibition event. I never thought of it as being “my” project. I felt it was very much about us as a community of women with a shared experience of being this age. I wanted them to feel they had a big ownership in it. So for me having that sense we were doing this book together was really, really important. The images tell stories – what was your process in creating each woman’s portrait with her? Three things were non-negotiable: it would be full-length, it would have a consistently dark background, and the women needed to be looking straight at the camera. ‘Other than that, the world’s your oyster,’ I would tell them. We would meet up for an hour or so and talk about how they’d like to be photographed. Inevitably they’d ask, “What am I going to wear?” And I’d say, “Well, it depends on what you want to say about yourself.” So we talked about the introducing props and styling. Sometimes I went to their homes to look through their wardrobes with them. Sometimes I would source the props, sometimes it was them. It was a quietly collaborative process. Then when they’d turn up on the day for the shoot, we would just do it. Afterwards I would chose 10 or 15 out of the set and I would let them come up with the one that they liked. Sometimes It wasn’t the prettiest photo of them. It was all about what the picture said. I had no input into their words. I felt that they knew themselves well enough and that is part of what this whole thing of being 60 is about – you can write your own words. You’re in charge. Can you pick out a few of the women’s stories that you’d like to share here? I’d never met Ro Cambridge, the woman with the dress made out of newspapers [pictured at top]. She’s a writer and we came up with this idea of making something out of books. So we went down to the local secondhand shop where she bought a whole bunch of books and disappeared. When she came back she’d ripped the pages out of these books she’d bought for 50 cents each and glued them onto these long strips of brown paper. About this stage of my life. She said she learned at a very young age that it was wise for her to be secretive. And she said, “I’m not sure if I can do this, Jenny. I’m not like these other women and I don’t want any fuss around me.” So we talked about how we could portray that. I went down to the local costume shop and found a few capes and things like that, and that’s how we did this photograph. Julia Bracegirdle, the woman with the bike, is a breast cancer survivor and actually has a missing breast. It’s interesting that people don’t notice it. 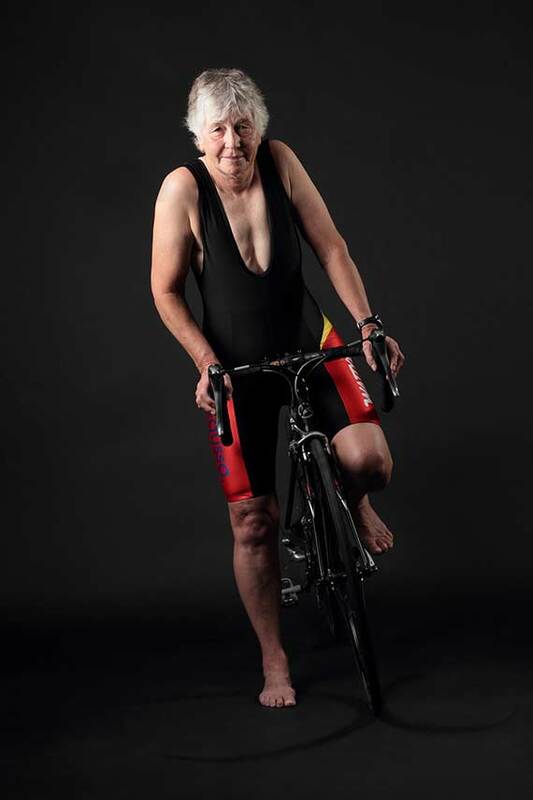 We had quite a conversation about that because we didn’t know whether the photograph was going to be about her being a breast cancer survivor or her doing Ironman stuff. We decided it’s about who she is now, and if people look at her in this shirt they might realize she hasn’t got a breast. I did a talk for a group of photographers and one of the women wanted to know about the photograph of Ros Rice with her avatar. Ros is quite open in her commentary about having met her husband through online dating. The woman at the talk said, “That’s so weird for a 60-year-old.” And I told her that’s what this book is all about. It’s all about saying or challenging some of those perceptions of what you think. She said, “But that’s something that teenagers do.” Well, no. Clearly not! It’s a really good example of blowing away some of those perceptions of what women at 60 are doing in this day and age. What would your 60-year-old self tell your 30-year-old self? I think my 60-year-old self would tell my 30-year-old self not to be so damn sure of myself. However, I would probably also say take risks. Don’t play it safe. Take sensible risks. Because it’s all about the journey, isn’t it? I had my children very young, so I’d also say, don’t be afraid of missing out on things, because there’s so much time to do what you want to do in life and you don’t have to do it in the order everybody else thinks you should. 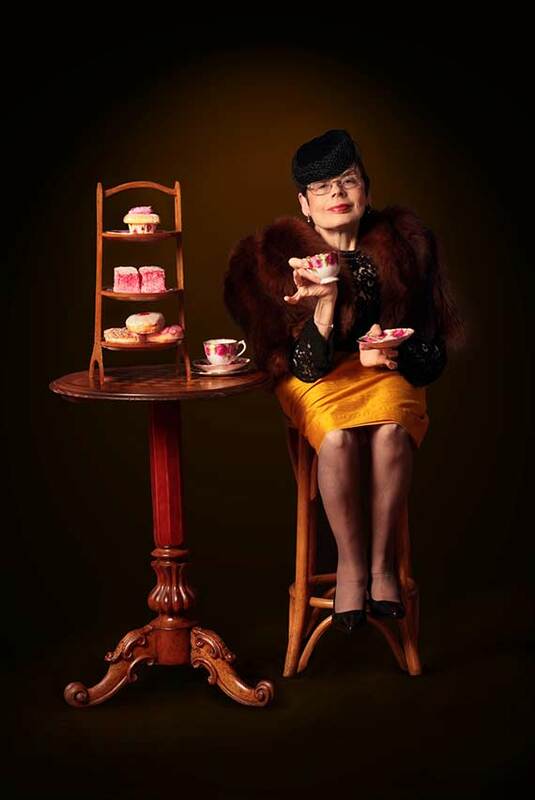 Aging with attitude is that sense of knowing yourself a lot more and of ‘I can be who I am now and really nobody needs to tell me how I should dress, how I should be.’ And it’s about bucking those stereotypes. We’re not sitting around knitting, we’re doing stuff, we’re active, we’re intelligent. Being a grandmother to my four teenage grandchildren is a huge part of my life. I thought they would have lost interest in me by now, but not so. Our relationship is stronger than ever and as a grandmother it’s lovely that they perceive you as aging with attitude. You’re modeling for them. “Visible” isn’t currently distributed in the US, but you can see more images in this video. I was fascinated with your photography experience and outstanding meeting people sharing ideas from different countries of the world. I am well traveled-lady around the world while I was working at United Nation in New York. I am a teacher in High School and Montessori kids which so much enjoy playing guitar and Ukelili. Since I travel so much how I wish you could drop a line if your not busy. Please if you email me so I can share ideas from my experience while raveling before. I’ve reached my 60’s but I don’t feel a day over 40!!! I’ve decided that each Birthday from now on I will go backwards by one year! In 2004, when I when I was 75, I created an exhibition called Seniors Legacy. I photographed 76 people 75 to 94 in 8 counties in Pennsylvania who were actively contributing to their community. They wrote about what they wanted people to know about being older and listed their activities. It and they were awesome! I wish you all much success and a happy, healthy life! Helen, that sounds like a great project. Is it published anywhere, online or in print? Hi Helen. You bring me to tears. I’m hoping to get to the US in the next 12 months and would love to meet you if that opportunity arose. You are welcome to email me through my website http://www.visibleat60.com if you would like to. An amazing project you did! Are the details available in print! If not, please try to get it done… I am elevated by your spirit. I wonder if someone would ever undertake a journey again with women over 75 years! Thank you ! Ordered a copy for myself and one for my friend , we live in New York and Texas . I hope this is not a problem . We both turned 60 this year , Again , thank you . Thanks Ethan and I get what you say. I’m going to do an e-book soon but maybe a I do a ‘lingering’ version of the video as well. I’m uploading the individual images through my Twitter Account – about one a day – and a snippet from each woman’s words in the book. That way you can at least linger a bit longer on the images. Can I get to see your photography on-line anywhere? Nearing my 61st year, I absolutely loved this montage and the message it sends! Ms O’Conner, I think you’re doing a great work. Its a very interesting subject/project and would like to continue to follow your website! I’m so delighted to see us NZ women standing proud and looking out to world. In our Maori language we say ‘Kia kaha. We stand strong together’. And I’m starting to feel a real sense of that from this book and the women from around the world who are clearly resonating with it. Thank you. Lovely. Wonderful. Thank you. Women are beautiful at every age. Loved this article and the photos – what an inspiration to us all. This is what my ‘The Visible Woman – More Lust, Less Must’ is all about – not putting yourself in a comfortable box and forgetting about yourself and your dreams. I am a subject in the book. I found it very liberating to have my photograph taken, a thing I have avoided in the past. A great project to have been involved in. Thank you for sharing your story and avatar with us! Sorry about the error. What a cool way to meet someone! Indeed Linda, virtual worlds are very different environments than dating sites. They are places you can talk and interact with people in real time. We both love to go to virtual concerts where musicians live-stream music, and amazing art exhibitions that use multi- dimensional opportunities to create and display art. How do you join in virtual sites? Hi Essie, google them you will be surprised there are a few. Here is an interview with a fashion designer in a virtual world. Congratulations on a wonderful article encouraging all of us to come out of the shadows and become gloriously visible. 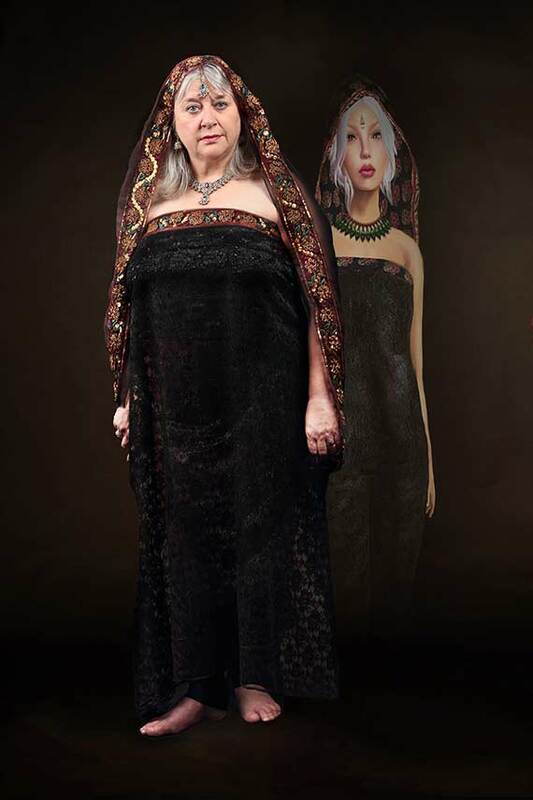 Jenny, thanks for the care and creativity you gave this superb photographic project capturing the inner spirit of these beautiful women. I was just in your beautiful NZ on vacation. Ros, thanks for explaining virtual worlds. Now I have to explore this way of connecting. Great idea. Love the photos. Hi Deborah. I’m Jenny the photographer. Its really lovely to know that even though I live at the bottom of the world in New Zealand, that we seem to have shared experiences of our life transitions.